In 1977, American sculptor Tom Otterness started to make waves in the art world when he filmed himself shooting his dog to his death. The piece established him as a risk-taking artist, not afraid to push the boundaries of what is socially acceptable. Yet the controversial work would eventually haunt him for years, particularly as shows of violence became scarce in an increasingly modern society. Veering off in a diametrically opposite direction, Otterness started working with lost wax and bronze to create public art installations. Often inhabiting parks, center squares and transportation infrastructures, Otterness' sculptures tend towards the comedic. They are cartoonish and cheeky, nodding at art history, pop culture, capitalism, greed and satire. 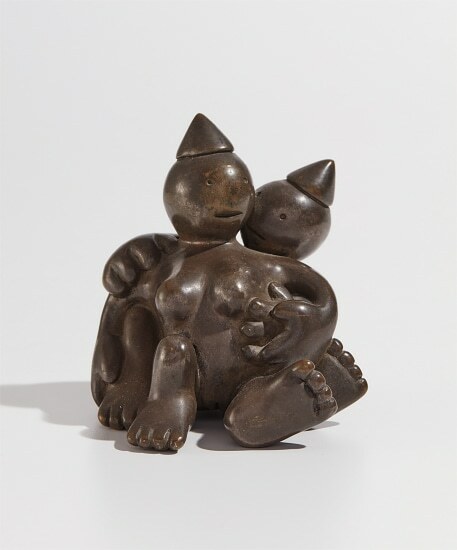 To date, Otterness is one of the most successful public artists world-wide. Bronze multiple with silver nitrate patina. Incised with initials, dated `© 92' and numbered 20/25 on the underside (there were also 10 artist's proofs), published by Artists Space, New York.